I watched The Job Lot, ITV's new comedy set in a jobcentre, last night. I worked in social security offices rather than jobcentres in my ten years in the civil service but I've signed on in them more times than I care to remember. I wasn't expecting too much from The Job Lot but I actually found it pretty funny and quite accurate too, more so in fact than many dramas set in the civil service. I'd defy anyone who's worked in or signed on at a jobcentre to say they didn't recognise at least one of the characters. Having time to kill after a match at the World Snooker Championship in Sheffield finished earlier than expected yesterday, the BBC put on a short piece presented by Steve Davis about the legendary player Joe Davis. Joe Davis grew up in the Queen's Hotel in Chesterfield, a long-demolished pub his ex-miner father was landlord of, which is where he honed his cue skills on its full size snooker table. The pub according to the photo of it in the piece was owned by the Mansfield Brewery which was taken over and shut down by Marstons with production of its beers being moved to Wolverhampton. Pubs and games such as billiards, snooker and darts have of course a long association. I'm trying to remember a pub scene in a novel set in 1930's England - by Graham Greene or Patrick Hamilton possibly - in which a character demonstrates how to play endless cannons in billiards. I drank the newly-launched Manchester Pale Ale from J.W. Lees for the first time today at the Rain Bar, the former umbrella factory that is now the brewery's flagship city centre pub. 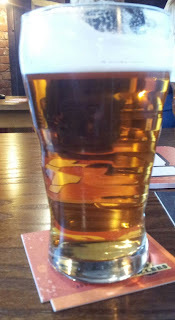 Manchester Pale Ale is golden, hoppy (dry-hopped?) and has the biscuity malt taste I associate with Lees beers. 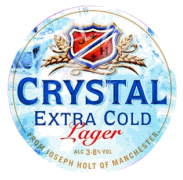 Like Marble's Manchester Bitter, you could see it as an attempt to replace the iconic but long gone Boddington's. 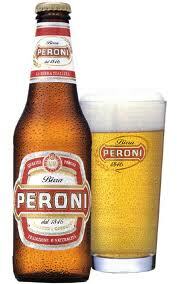 Not posh enough for Peroni? Today's Grauniad reports that a golf club in Skegness, a windswept East Coast resort where I holidayed once as a child, has been refused permission to sell draught Peroni, allegedly because it's not posh enough for the upmarket Italian lager. I've drunk bottles of Peroni in Italian restaurants and quite like it but I had no idea it was now a premier product up there with Bollinger champagne and Grand Cru Burgundy. A spokesman for the brewery, SABMiller, defended the decision by saying "Throughput on kegs does affect quality". I though the whole point of keg beer was that it doesn't go off, especially in places like clubs which have an up and down trade. 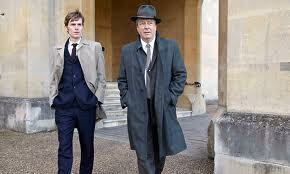 I've been watching and enjoying the Inspector Morse prequel Endeavour. Unlike the Morse sequel Lewis, which I've never been able to get into, Endeavour has got everything the original series had: classic cars, crossword puzzles, opera, pubs and beer. The relationship between the young Morse and his inspector is more of a father-son one as he guides him through his first cases as a detective. I also like Endeavour because, as with Inspector Morse, at the end of two hours you're usually left scratching your head over the loose ends. I went to a Thatcher funeral party yesterday. The choice of beer was Stella or the Polish lager Tyskie. 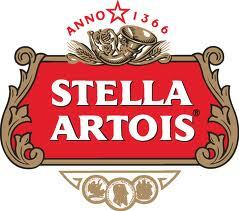 As I've said before, I don't mind Stella. It has a smack of hops that gives it the bitterness you expect in a Pils. I hadn't drunk Tyskie before. I can't imagine what someone asked to describe the taste of Tyskie - like the beer experts at the Brewing Industry International Awards in 2002 who gave it their Gold Medal and Grand Prix - would write. It's not spit-it-out-of-your-mouth unpleasant, it's just completely tasteless. It literally has no taste. Yet again you're left wondering whether anyone actually drinks stuff like this and positively enjoys it. There's a video doing the rounds on social media and blogs of a Swedish journalist who travels to Leuven in Belgium to interview the drinkers and brewers of Stella Artois. It's easy to poke fun at the AB InBev PR guy who talks about his "passion" for the company's "brands" but can't describe what the beer tastes like. I'm not sure what the point is though. Stella is a long way from being the world's most exciting beer but it isn't positively unpleasant. It's better I'd say than many mass-produced lagers. I like beer. I'd rather drink cask conditioned beer in top condition but I still prefer beer to wine or cider. Given the choice between a can of Stella and a world famous claret, I'd choose the former. Someone brought me a packet of Guinness crisps back from Ireland this week. I like Guinness and I like crisps so I'm among those the Diageo marketing team is aiming for with this product. And I did enjoy them, although you can't really tell that they're made with Guinness. This month's edition of the CAMRA newspaper What's Brewing dropped through the letter box before. It seems like half the paper is devoted to people arguing that craft keg is the new big thing and asking when CAMRA is going to start promoting it. You know what, I don't care. None of the pubs I drink in regularly in Manchester sell it and I doubt there are more than a couple of dozen in the whole country that do. If people like it and want to drink it, that's fine but it has no relevance to the vast majority of drinkers and CAMRA members. And no one has ever been able to tell me why this isn't craft keg.